This Digital Millikan Apparatus provides clear visibility of spheres and conducts determinations in two different ways. Users can allow a selected sphere to fall through a measured distance with no electric field present then apply an electric field and observe the velocity of the rising sphere. They could also allow a sphere to fall freely then apply a high-voltage field until the sphere is suspended. 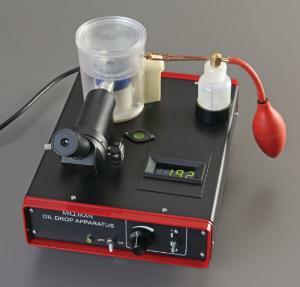 Built-in to this compact tabletop unit are all the accessories you need to perform Millikan experiments, including a microscope, an illuminator, a 0—500VDC voltmeter, and all the necessary power inputs. Pure olive oil is recommended, but not included. Once it's on a lab table and plugged into a 110VAC outlet, it is ready to use. For added convenience, the spray bottle system features a reservoir that attaches to the top of the unit, so you don’t have to look away during the experiment. Controls include an on-off switch, a polarity-reversing switch, a potentiometer for fine control of plate voltages, and a voltmeter for indicating plate voltage. A digital voltmeter also provides easy and accurate readings.